These elegant shoulder planes are vital tools for trimming and improving cut joints, particularly shoulders, rabbets, tenons, and grooves. The Bronze lever cap is higher for better grip and closer to the blade bevel for better support. The mouth geometry allows for better chip clearance, while the adjustable mouth and locking screws are large and convenient. The mouth adjustment screw is captured in the front shoe and threaded into the body so it adjusts the mouth both when turned in and turned out. The captive-nut blade adjustment is very positive. Bodies are cast from Ductile Iron, precisely ground flat and square - an essential feature for a shoulder plane. Blades are A2 Tool Steel, hardened to Rockwell 60-62, cryogenically treated and double tempered to hold a very fine edge for a long time. Blades are bedded at 18°, beveled at 25°, and .005" wider than the body to ensure crisp, 90° cuts. This is the smallest of the Preston style shoulder planes, 5/8" wide, 5 3/4" long. The blade is .140" thick, and the tool weighs 1.35 lbs. With an adjustable mouth like its larger siblings, this tool is just right for trimming and fitting small tenons, dadoes and rabbets. About half the width and weight of the Large Shoulder Plane, the medium size is well suited for lighter work. Excellent size for furniture joinery. Body is 7¾" long x ¾" wide. Blade is ¾" x .140" thick. Weight 2.35 lbs. 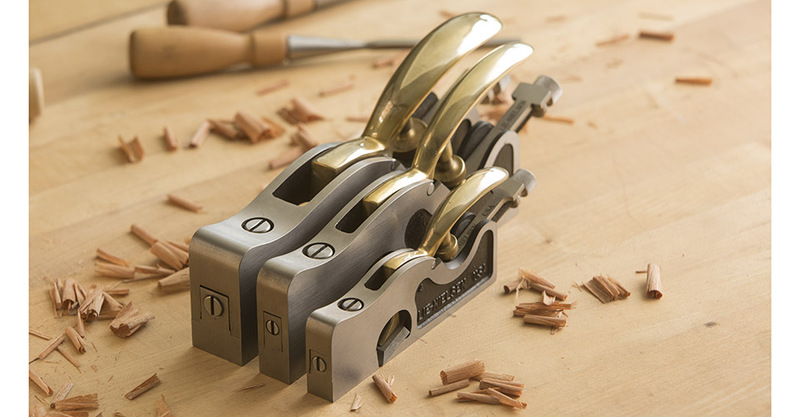 A versatile, general purpose Shoulder Plane with nice heft and the best size to start with. 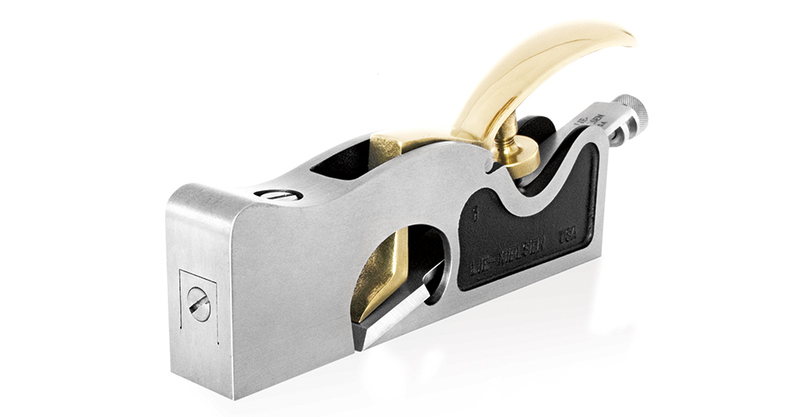 This all-metal Shoulder Plane is based on the Record 073, which in turn was based on a Preston model. Body is 8¼" long x 1¼" wide. Blade is 1¼" wide x .140" thick. Weight 4 lbs. The Lie-Nielsen Shoulder Planes are based on Record models. The Large shoulder plane is based on the 073, the Medium on the 042, and the Small is based on the 041. Each in turn was based on a Preston model. The body of these all-metal Shoulder Planes are cast of Ductile Iron, and the caps are Bronze. We have made some design improvements to the Record versions. The cap is a bit higher in the back to allow a better grip; the front of the cap is closer to the bevel of the blade for better support; the geometry of the mouth will allow better chip clearance; the mouth adjustment is much easier, and the blade is much harder and thicker. The blade is bedded in the tool at 18° with a 25° bevel, making the included cutting angle 43°. Loosen the Brass spinwheel under the cap a couple of turns, tighten it halfway, and adjust the blade with the Stainless Steel adjuster nut. 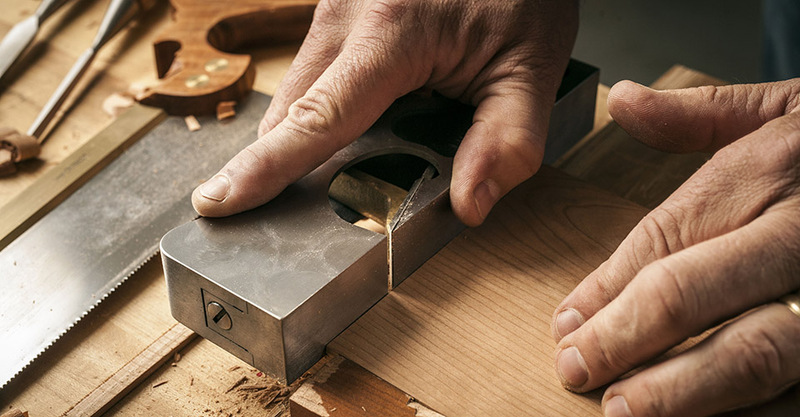 Make sure the mouth is open adequately before advancing the blade to avoid damaging your edge. Re-tighten the spinwheel. Do not overtighten. The blade is about .005" wider than the body. Align the edge of the blade with the side of the body that you want it to be flush with. Laying the tool on its side can help you do this quickly and accurately. Or if you wish, you can grind a little material off the side of the blade to make it flush with both sides. Loosen the lock screw on the top front of the tool by a half turn or so. Adjust the mouth opening by turning the screw head at the very front of the tool with a screwdriver. Make sure you do not close the mouth on the blade edge. Re-tighten the lock screw. The body is cast from Ductile Iron, a very strong alloy that will take a lot of abuse. These castings are fully stress-relieved, a process that removes inherent stresses and ensures that the tool will remain flat and true. The cap is Manganese Bronze. Other parts are Brass; the adjuster nut is Stainless Steel. The blade is A2 Tool Steel hardened to Rockwell 60-62, cryogenically treated and double tempered. Our heat treating technique ensures that the blade will take and hold a very fine edge for a long time. After heat treating, the blade is fully surface ground on the top, back, and cutting edge, giving a smooth, flat surface that will take a mirror finish very quickly. The thick blade provides solid chatter-free cutting. The body casting is ground dead flat. Occasional hand lapping with fine wet/dry sandpaper (320 grit or higher) on a flat surface will help remove dings and keep it true. The cap can be polished with any good brass polish, although many people like the patina that Bronze gets with age and use. Occasionally the tool should be disassembled, cleaned and moving parts oiled. A light oiling on the threaded rod and Brass adjuster will keep them moving freely. The blade should be kept lightly oiled to prevent rust, especially when the tool is not in use. We recommend Jojoba Oil, a plant based oil product that is non-toxic, odor-free and easy to use. Also, in our shop, we use a fine abrasive handblock to remove any light surface oxide from tool bodies and blades. Jojoba Oil and abrasive handblocks are available from us.